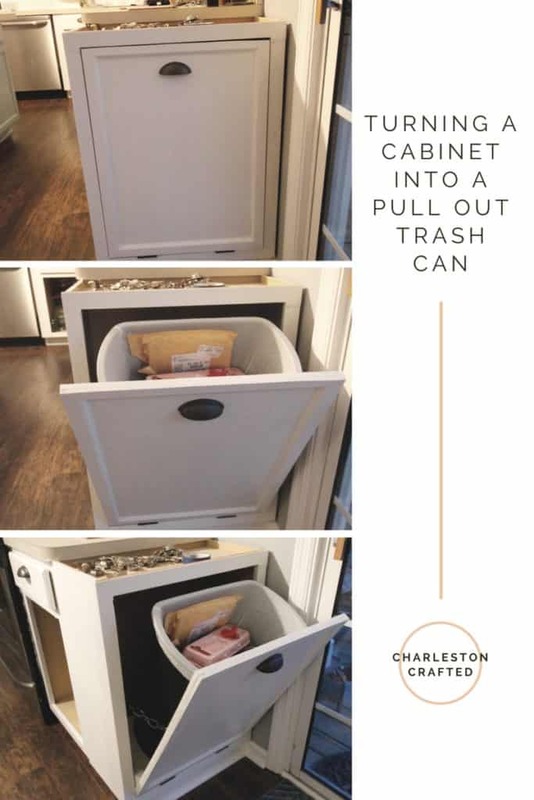 Want to add a cabinet trash can to your kitchen? 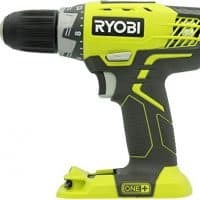 Here’s how to DIY it! Last week, we told you about how we turned one of our old upper cabinets into open shelving on the end of our kitchen island. That was mostly to make our island bigger and add to our aesthetics. Today’s transformation is 100% for functionality. We turned the second cabinet into a pull out trash can! 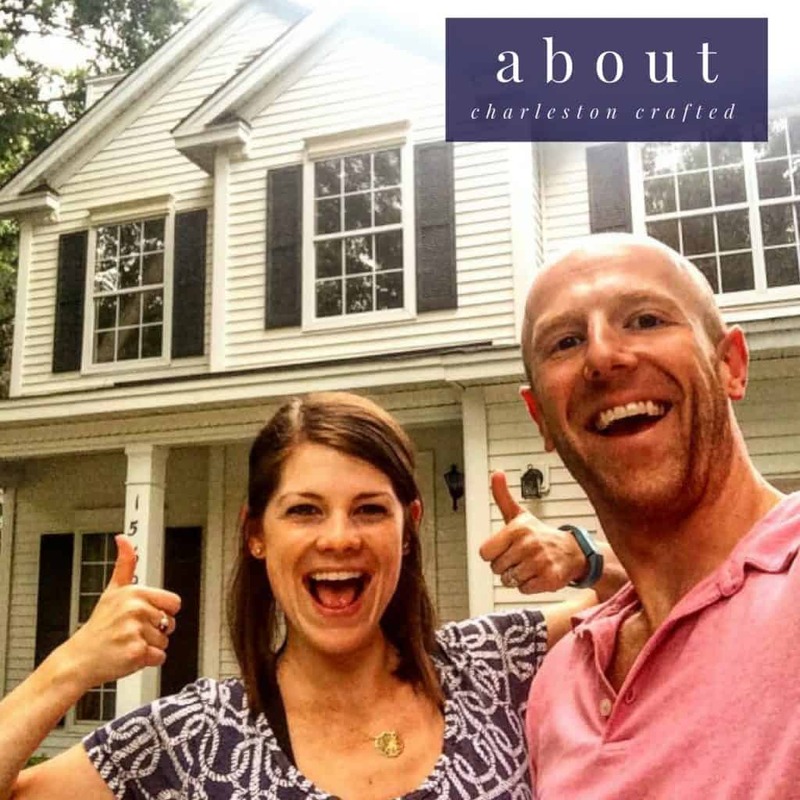 Click here to pin this project to your Pinterest board. We’ve been having a problem lately with CiCi getting into our trash can. Even though it’s locked. Even though it’s attached to the cabinet with a hook. Ugghh. I digress. So, we needed a hidden trash can. 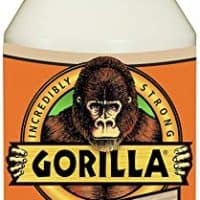 I started building this the same way we did the open shelving, by cutting off the top, cutting the rest down to size and reattaching the top to the main section with wood glue and caulk. For this, I had to build the recessed base again, but I extended it out further this time and didn’t add decorative legs because we just wanted it to look like the rest of the cabinets. 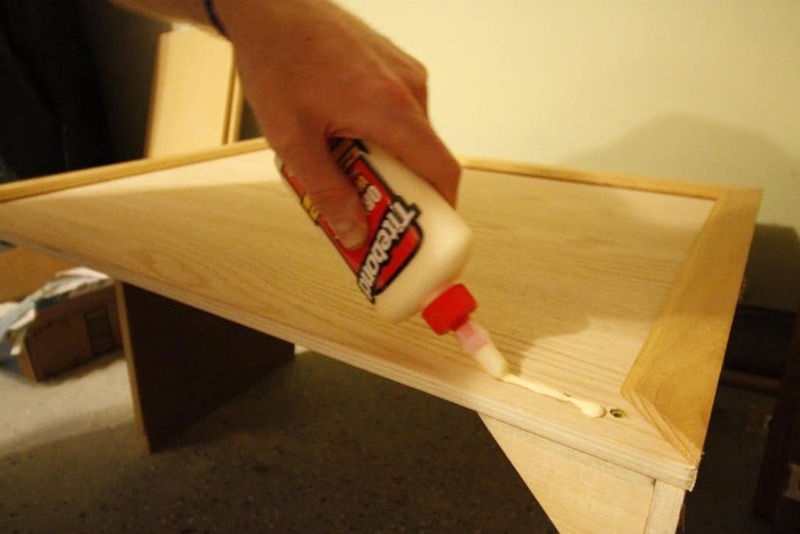 Again, I had to use a flat board to wedge between the new base and the cabinet in order to make up for the gap. We needed a way to pull the trash can out. I looked into sliding bases, but these are built to put your trash can in long ways and slide out with the thinner side first. We had to use the wide side out because we were using a cabinet. So, we decided to do a tilt out style. We bought one piece of oak board to match the rest of the cabinets and cut it into two pieces. 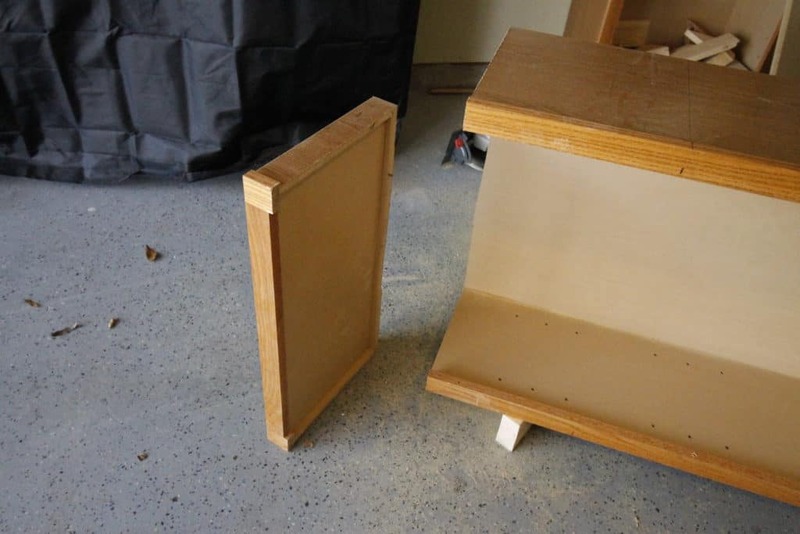 The front piece was 1/8″ smaller on all four sides than the gap we had on the front of the cabinet so that it would pull in and out. 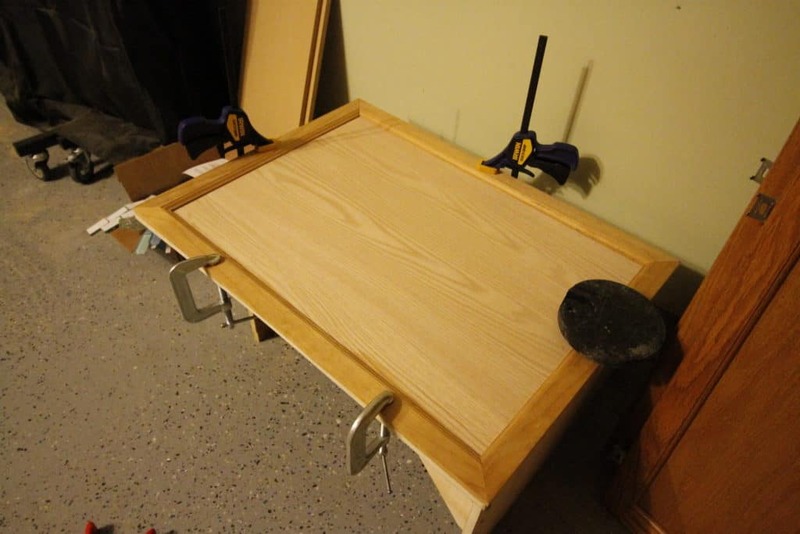 Then, I cut another board the same width and 10″ deep, which is slightly shorter than the depth of the cabinet. 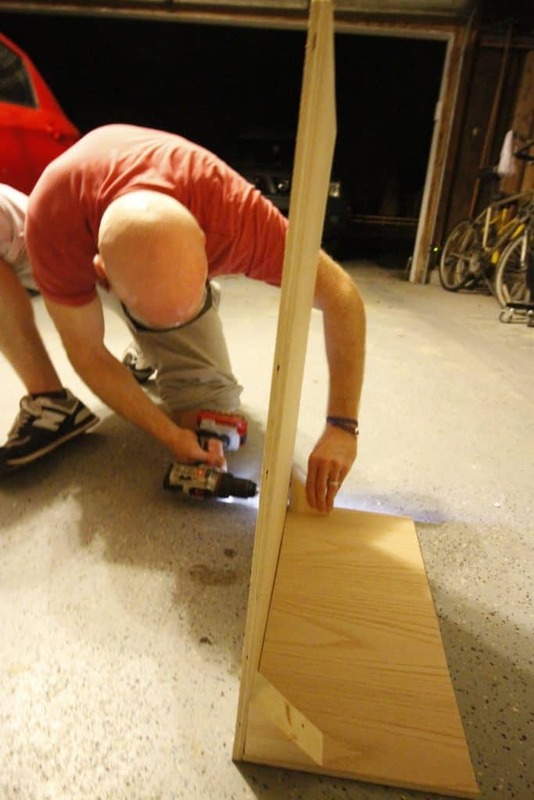 Then I attached them with two screws and two triangular cuts of 2x4s to form the door and base that the trash can would sit on. The last step to building the door was adding a bit of trim to the outside, also to match the rest of the cabinets. This piece was literally something that the previous owners had left in the garage, so it was great to be able to find a use for it. Finally came the hardware. 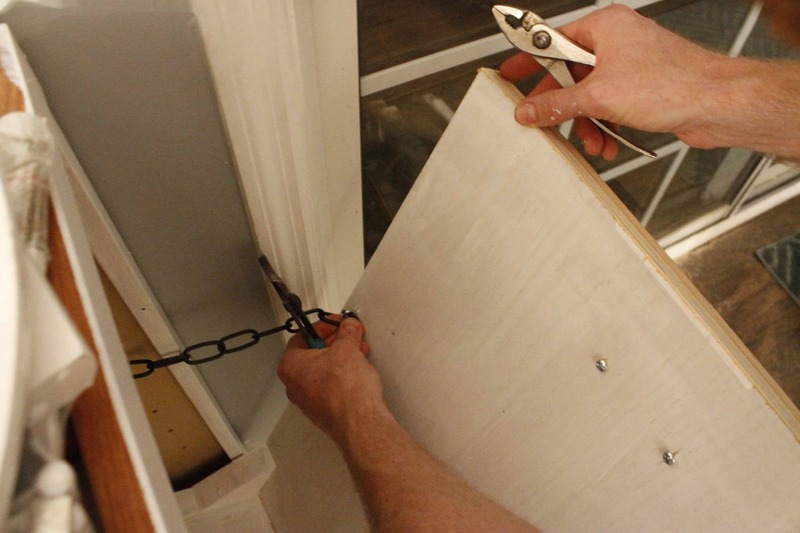 The door tilts out using two hinges on the bottom and two chains to keep it from going too far out. We painted the pull out trash can white to match what we were painting all the other cabinets and added a pull handle. In the end, we’re so happy with it! 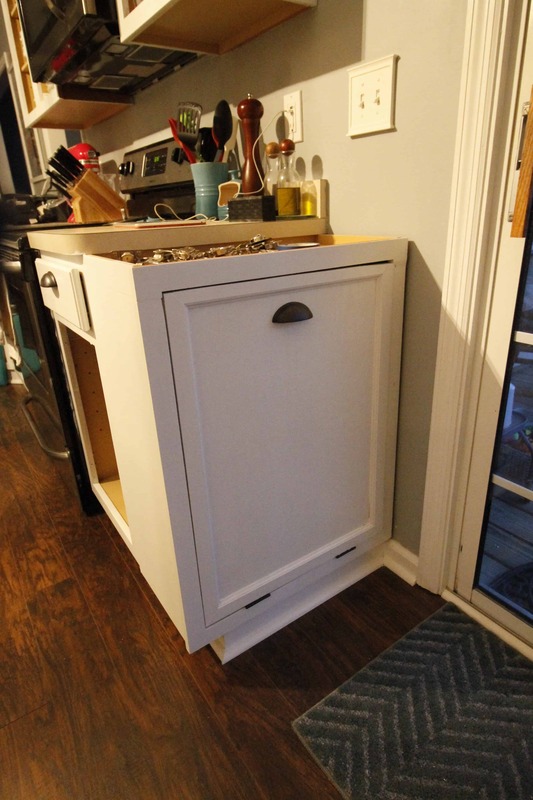 It looks fantastic and we were able to turn two old cabinets into two useful additions to our kitchen. Now we just need to get our new counters on so that we can see the whole thing come together! 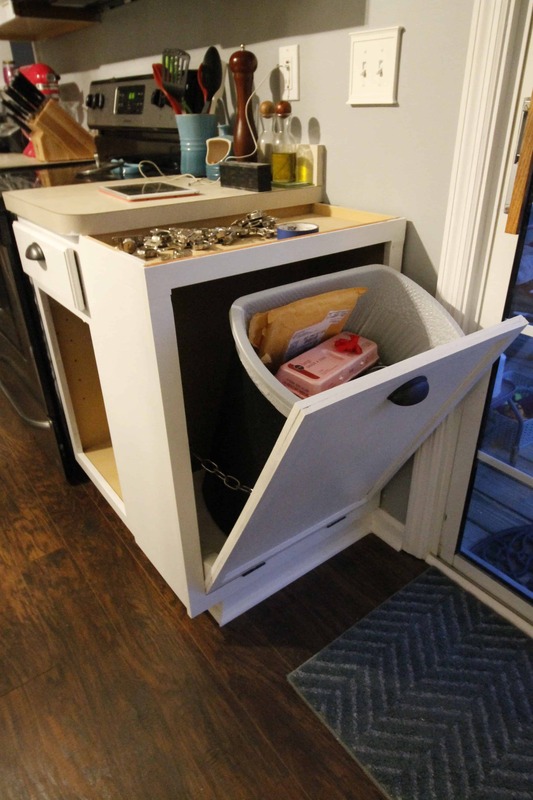 It's easy to hide your kitchen trash can inside a kitchen cabinet. 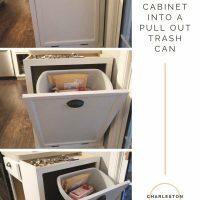 Here is how to turn a regular kitchen cabinet into a DIY tilt out pull out kitchen cabinet trash can. 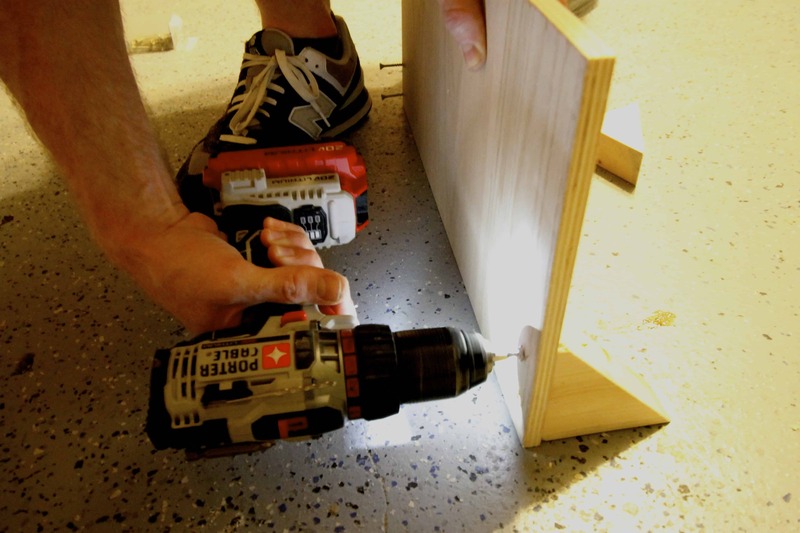 Cut plywood to 1/8" smaller on each side than the gap on the front of the cabinet. 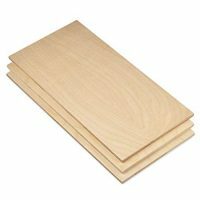 Cut another section of plywood the same width and 10″ deep, or slightly shorter than the depth of the cabinet. 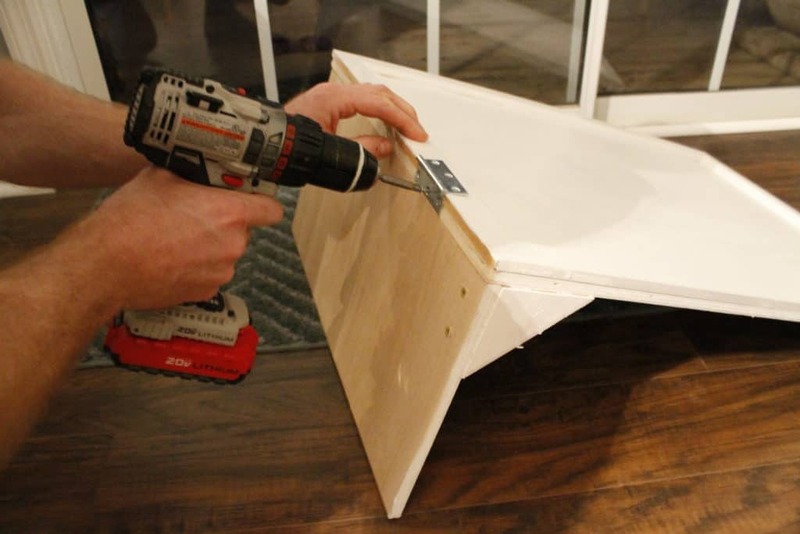 Attach them with two screws and two triangular cuts of 2x4s to form the door and base that the trash can would sit on. Use wood glue to attach trim to the front of the board to mimic trim on other cabinets. 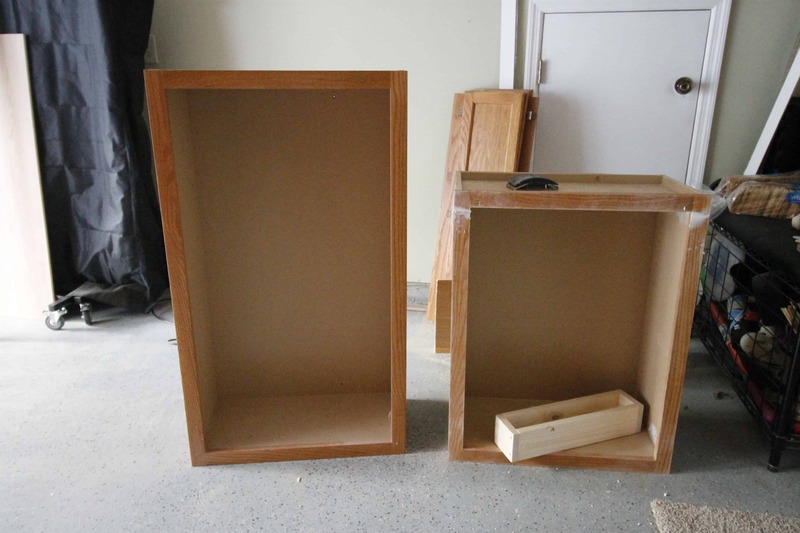 Add 2 hinges to the bottom of the L shaped door and then to the cabinet. 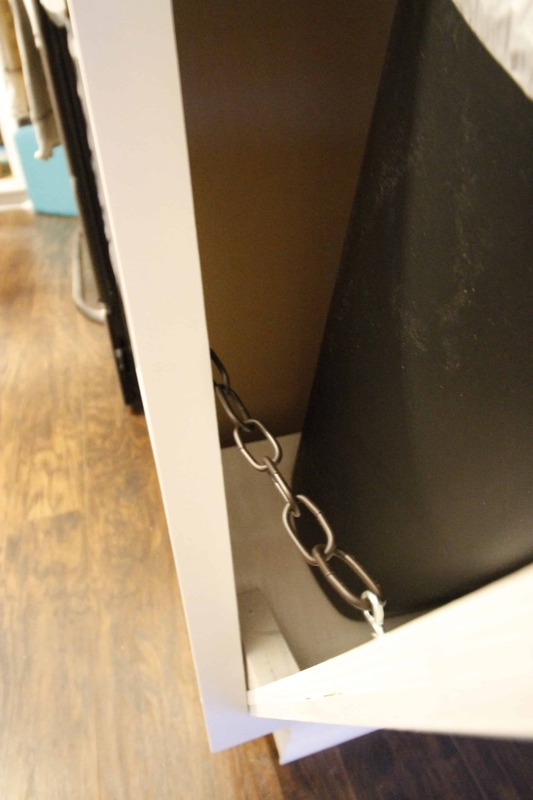 Add chain to the cabinet using eye hooks so it can't open too wide. Screw into place with other cabinets. 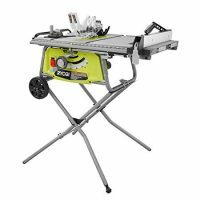 You may need to create a small base using scrap lumber and/or quarter round. 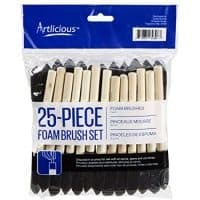 Just mimic whatever your other cabinets have for a seamless look! Be sure to click over and see the results of our DIY coastal kitchen makeover!